City tram routes and interurban routes were amalgamated in 1968, and the vast, 15-route tram system was upgraded. The new vehicles have been designated the 4000 series. The interior of a 4000 series light rail vehicle. The 5000 series light rail vehicle has low floors for two thirds of its length. The interior of the 5000 series. The 5000 series boast the latest technology in door systems. Most central routes have been relocated just below the surface: the two-level Friesenplatz station. U-Bahn signage is found elsewhere in Germany to denote true metro operations. High-floor trams at Neumarkt, one of the few surface sections in the central area. 252 low-floor Bombardier Flexity Swifts have been delivered to KVB. Multiple routes at stations call for comprehensive service information. Just north of the Hauptbahnhof, construction works for the new north-south line. Germany’s fourth most populous city, Köln (Cologne), 200km north of Frankfurt, is cut in two by the River Rhine with rail and light rail routes crossing by a series of bridges. Köln is a major international business centre, having its traffic-generating Messe (trade fair site) unusually close to the city centre. Encouraged by a new rail link to the city by DB ICE, regional and S-Bahn services, Köln-Bonn Airport has expanded rapidly as a hub for low-cost carriers. "Kölner Verkehrs- Betriebe (KVB) now operates the second largest tramway and light rail system in Germany." In the early 1960s, a decision was made to integrate and develop a collection of tramways previously under various ownerships; moreover it was decided not to create a separate metro rail system for the city. Supplementing the Rhine-Ruhr region’s extensive heavy rail coverage, Kölner Verkehrs- Betriebe (KVB) now operates the second largest tramway and light rail system in Germany with a track length of over 190km (118 miles), all part of the Verkehrsverbund Rhein-Sieg (VRS) for ticketing purposes. Modernisation of such an extensive tram network has been ongoing, having first begun in 1956. During the 1960s, the city’s articulated trams benefitted from large-scale investment, and the pace of modernisation has remained fast ever since. City tram routes and interurban routes were amalgamated in 1968, and the vast, 15-route tram system upgraded. The largest single order for new-generation light rail vehicles was placed by the Dutch city of Amsterdam as part of a major exercise to replace its antiquated fleet of 234 trams. Among the major works carried out at this time was the transfer underground of the city centre tram routes, mainly using cut and cover along main thoroughfares. By 2001 KVB had achieved a 69% cost recovery rate. Köln, long notorious for its road congestion, has approximately 90% of residents using the KVB system, a situation that encouraged continuing public transport development. Capacity on the two cross-city tunnels had been at saturation point for some years, so the beginning of work on a third main tunnel under the city centre was a much-needed step. The tunnel will be 33km long, and is expected to be opened sometime after 2015. Significant development dates have been: 27 May 2000 – Line 1 extended underground (500m) at its eastern end to Bensberg; 15 June 2002 – Line 1 Junkersdorf – Weiden-Schulstrasse (2.7km) and Line 3 Bocklemünd – Mengenich-Ollenhauerring; 16 June 2003 – Line 4 rebuilt to Stadtbahn standard between Keupstrasse and Odenthaler Strasse; May 2006 – Line 1 Weiden-Schulstrasse-Weiden West (1km). The inner city subway comprises a coherent network of 34km of tracks, fed by 35 city bus routes. This has given Köln an integrated and reliable complete transport system at a lower cost than providing a complete heavy metro network. Eight tram routes have been upgraded to light rail standards in the programme begun in the 1970s. These all have 900mm-high station platforms and use tunnels and/or surface tracks laid on reserved alignments. The Flexity family of light rail vehicles (LRVs) is manufactured by Bombardier Transportation. However, during the 1980s, it became evident that it would not be viable to convert the furthest outlying lines to these Stadtbahn specifications, or, in the case of Lines six and twelve, that the lines had curves which were too sharp for Stadtbahn operation. Irrespective of high or low floor, the service is variously referred to in the area as Strassenbahn (tramway), Stadtbahn (city railway) or even U-Bahn (underground), the latter being how routes are signed at street entrances. The underground sections of the Amsterdamstrasse line operate on a different power system than the rest of the network. Lack of space precluded use of conventional overhead wires, and a space-saving conductor rail is incorporated in the tunnel roofs. A novel system of operation is used on two lines which link Köln and Bonn. The 34km Route 18 is now the network’s longest line, and its third busiest, used by over 70,000 passengers per day. Each of the two cities pools a series of modern K5000 vehicles for use on these lines. Historically Köln operators had been heavily involved in developing vehicles with builders, notably Düwag (later Siemens). New rolling stock orders from BN of Belgium (later Bombardier) were the first to be placed with a foreign manufacturer by a German authority, with high and low floor versions of the Flexity family eventually supplied. "A 3.9km long north-south tunnel is under construction from Breslauer Platz (Hauptbahnhof) to Bonntor via Heumarkt, Severinstrasse and Chlodwigplatz." Vehicles are designed to be low-cost, both in terms of construction and maintenance. Following an existing contract for 146 vehicles, KVB called up an option for 69 low-floor, bi-directional K4500s from Bombardier Transportation and Vossloh Kiepe. The low-floor K4500 design is based on the earlier high-floor K5000 (which also have low-floor capability) incorporating standard components. The new light rail vehicles have proved their worth, prompting the authorities of Stockholm, and Croydon, UK, to adopt variations of the design for their own networks. KVB runs 380 Bombardier high and low-floor vehicles. 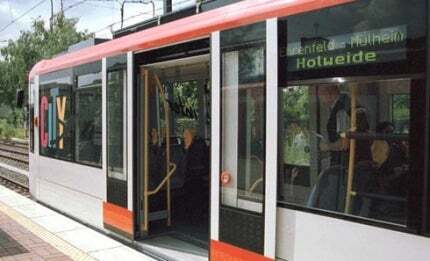 There is very little interchange between the old-style tram and modern Stadtbahn systems. While the original network is largely controlled under a conventional fixed block system, the vehicles on the new light rail routes are governed by a state-of-the-art central control unit. "The 34km Route 18 is now the network’s longest line, and its third busiest, used by over 70,000 passengers per day." In the event of a fault, it is displayed on the driver’s control unit, which also shows the action necessary to rectify it. A fault log is also stored in the system to provide background data on the fault, as well as the time and frequency of their occurrence. The front and rear of each trainset is fitted with two LCD displays, showing clearly the line number and route information. Colour LCD displays inside the cars indicate the various stops on the route served. A 3.9km long north-south tunnel is under construction from Breslauer Platz (Hauptbahnhof) to Bonntor via Heumarkt, Severinstrasse and Chlodwigplatz, with the new Rathaus station bringing the tourist hotspot of the Altstadt onto the network. Construction was delayed in March 2009 when part of a tunnel collapsed while it was being built. The tunnel was originally scheduled to be opened in late 2011, but is now only expected to be operational after 2015. Part of a shorter service from Dom to Rathaus was opened in December 2012. An extension to Heumarkt is planned to be opened in December 2013. Schrey & Veit specialises in the fields of vibration technology. Our team has years of experience in shock and vibration isolation, vibration damping, acoustic and production engineering in the railway, aviation / aerospace and automotive industries. Rhomberg Rail, part of the Rhomberg Group, is a prime contractor and specialist consultancy covering all types of infrastructure concerning railways across the world. handraiLIT is a modern, cost-effective orientation and guidance system for railway tunnels and many other applications. Zoka is a monitoring and communications system for large construction sites.